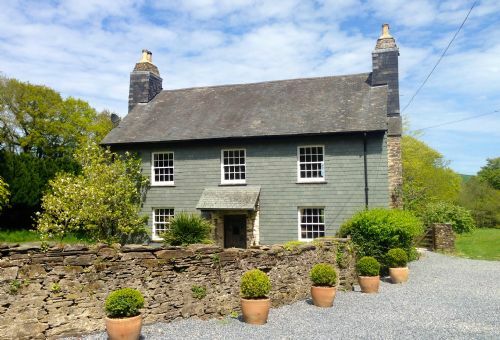 Beautiful Victorian Farmhouse in a secluded valley in the heart of the stunning South Hams, Devon. A great property for family holidays and getting away with those friends you haven't spent enough time with recently! The farmhouse has it's own gardens as well as 70 acres of farmland to explore and a well equipped games room. Space for the kids and relaxation for the adults. If like us you have sometimes struggled to find holiday accommodation if you have more than 2 dogs then this is the place for you. 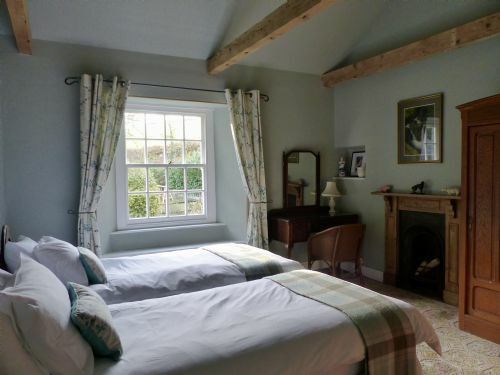 Quite simply the best dog friendly accommodation we have ever had in a beautiful location with plenty of glorious walks on your doorstep or even more stunning walks if you want to get in your car and travel a little further afield to Dartmoor or the coast. The help we had from Di and Tim (plus from Roger and Emily as the result of a slight dog emergency) was above and beyond. Our thanks to all for a fantastic and delightful stay, that went all too quickly. We had a fabulous long weekend at Fletechers Coombe to celebrate our mums 75th Birthdays. There were 6 of us and we all thought that the farmhouse was just beautiful. 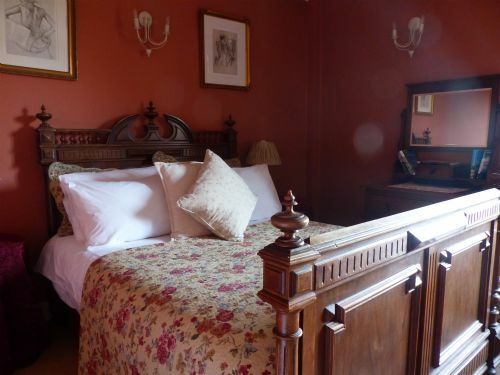 It was homely and comfortabel, the beds and linen were of excellent quality and very comfortable. The grounds and location of the property are so lovely and very peaceful. We couldn't have asked for more. Di was very helpful throughout the booking and it was lovely to meet her while we were there and the customer care continued while we stayed, she was very helpful....and the yummy carrot cake on arrival was a lovely touch. The house had everything that we needed. We would definitley recommend this property and would love to return. It was a good loction for exploring Dartmouth and Dartmoor and the surrounding areas. Second stay at this idyllic cottage. Cottage, garden as farmland beautiful. Location great (seems to be about half an hour from aleverywhere we wanted to go). Kayaking on river dart was a highlight. Cannot recommend cottage and area highly enough. Host, Di, is really lovely and very helpful. Thanks Rachael, I'm so pleased you had a good time. Thanks for coming back, it was lovely to see your family having fun! See you again soon I hope. It was a pleasant and comfortable property, which became very cosy with the wood burner alight. Possibly the middle of February is not the best time to visit as it was not conducive to getting full enjoyment of the outside environment. The Games Room certainly was well used. 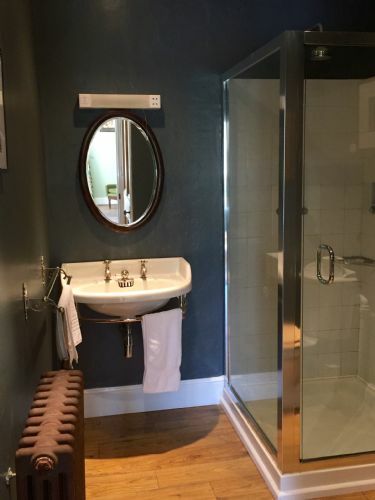 Our only criticism is that there are no hooks in the en-suite bathroom which meant taking the towel stand in from the bedroom rather than putting clothing on the floor. We had a fabulous week in this spacious comfortable farmhouse. For such a lovely place to be dog friendly was an added bonus for us. Beautiful walks from the door, in an idyllic peaceful location. The road leading to the house is very narrow, but you soon get used to it! It definitely won’t put us off returning to such a wonderful place! So please you had a great time and loved the house. Thank you so much for leaving it so tidy. Perfect guests! Hope to see you again soon. Love the house, love the service, just love it! Picturesque house in an idilic location. We felt we had everything we needed from the get go to make for a perfect get away. Thanks! 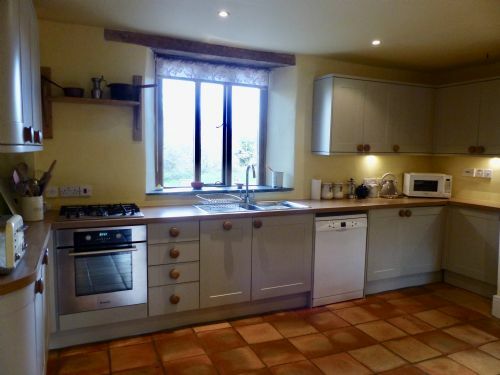 The farmhouse at Fletchers Coombe is perfect for a large family or group. The house is cosy but also spacious. All 4 bedrooms are great. The gardens are amazing. The location is remote so you feel hidden away but it’s easy to drive to reach the beach or the National Park. This is a lovely place to stay. 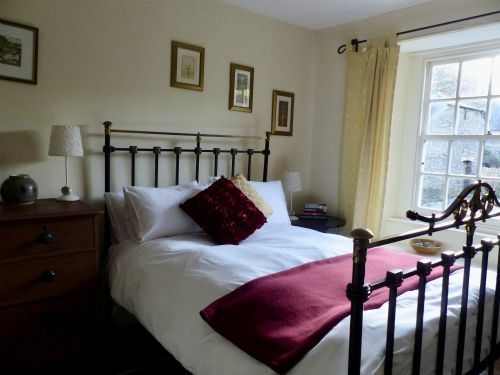 The house is comfortable and characterful, with everything we needed. The location is idyllic, the only slight downside being the access lane which is very narrow! Overall a wonderful place to stay. Spent 10 days here with four dogs. Accommodation is exceptional; homely yet furnished in a very thoughtful and individual way and it soon became 'our home' (I wish!). We were surrounded by beautiful things in an idylllic setting. Wildlife is fantastic; I have never seen so many specieis of songbird in one place. The fenced garden is really lovely but note that the paddock is not secure for adventurous dogs! We did find walks a bit difficult because to access them you have to walk along the very narrow road and also the stock seemed to be moved around rather a lot. Totnes is nice to visit, also Dartington Hall. We loved the games room too. All in all a very restful place and nothing was too much trouble for Di. Highly recommended. Absolutely everything was perfect from start to finish, even the rain couldn't spoil our stay, we only wish we had booked for longer and would definitely go back again. We stayed in the farmhouse with our 3 children 11,9 and 6. Had a brilliant time! House had everything we needed and lots of home comforts. 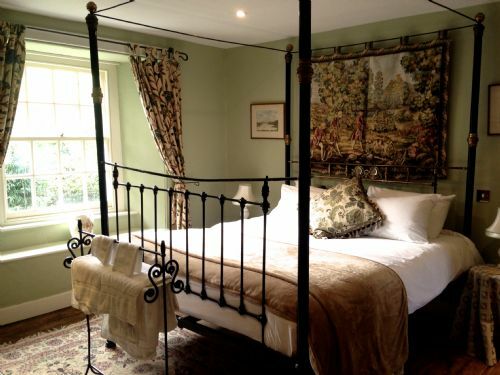 Lovely rooms- great website still doesn't do it justice. Di and her husband were professional, friendly and helpful in sorting out a heating issue in the first day. Boys loved boating on pond,games room and bikes. Dog loved beautiful walks on the doorstep. Spotted deer in adjacent field. It is remote and the final track a bit hairy but that added to the charm. Local area packed with low cost things to do. All of us very sad to leave and already looking at we can return. Perfect house and grounds and location. It was very tempting to spend the whole holiday just at the house - lovely garden, terrace, pond etc. and great walks straight from the property. Every single room is lovely. Our (clean and (mostly) well-behaved) dogs were very welcome and the enclosed front garden meant we could relax. Well equipped; clean; warm. Welcome cake most appreciated!! We didn't leave ourselves enough time to make use of the excellent games room - thankfully we had great weather, so spent our waking hours outdoors. We really loved our week away at Fletchers Combe and were really impressed with the level of detail regarding our comfort. Loved the carrot cake, the soap dispensers, the roll top bath, the boat on the pond (my nearly 10 year old particularly loved this!) the luxurious sofas and the mattresses on the beds were cloud like! We all slept so well! Di and her husband were very responsive to our questions and queries and lovely people to boot. The garden was amazing and beautifully kept with fruit trees, grasses, pond plants and much more. It was eden, and we felt we'd really got away from it all. We felt very cut off in terms of communication - our phones did not pick up any signal - even if we walked to the gate or further up the road. Not our host's fault at all - more down to BT mobile! However, our eldest son has a life threatening allergy and we have a very over active 7 year old. We weren't too sure how we would deal with an emergency if one arose and this made us slightly anxious. It would be great to have phone in the house for this purpose. Maybe with an honesty box to cover costs or a pay phone? Not sure what would work best but this would have reassured us a little. The reason I have given a 'ok' for location was because we hadn't quite appreciated how precarious/limiting the route to the cottage would be. Walking on the road, especially if a car came round the corner, was very risky. There was no room to get out of the way if needs be. For this reason, we chose not to cycle with the children from the house. Also, due to young bulls in the fields around us, we weren't able to walk cross country. On speaking to a farmer (we think) with a dog one morning he kindly explained that there was a lively bull he was trying to herd through with no success. He suggested that we were particularly careful with the children. So again, we decided not to take the risk. My husband also had an unfortunate encounter on the final day, when a local family (we know this as they asked if my husband was local and when he said no, they said they were and asked him to move) demanded that he backed over half a mile uphill and around corners when they had just passed a passing place further down the lane. Despite asking them if they would mind backing a short distance down hill to the nearby passing place, they refused. I would imagine that being local they are relative experts at backing up down the lane whereas my husband certainly isn't! Very stressful and sadly this coloured how we felt about the accessibility of Fletchers Combe. Really can't praise Fletchers Combe enough. Felt at home as soon as we arrived. It's a beautiful farmhouse, decorated authentically, and decorated as a home rather than a holiday home. 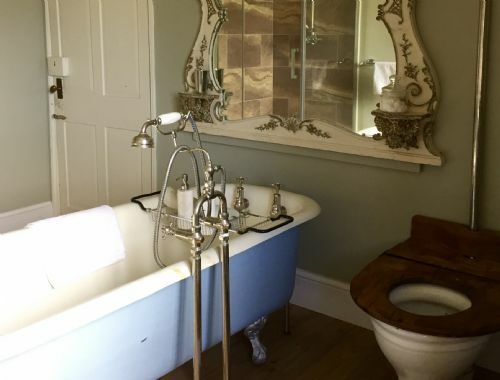 Farmhouse kitchen, luxurious showers, roll top bath, and four poster beds made us feel instantly relaxed. All helped of course by the amazing location. Surrounded by beautiful gardens, and countryside, both my family, and my dogs, loved trying out the walks recommend by the owners. Really think we've found our perfect holiday getaway! On arrival we all had the WOW! Factor. A lovely big farmhouse with lots of character, furnished very well to suit the character of the house. Loved the "His Masters Voice gramophone" with Nipper the dog, would have been great to have played some old records on it. We loved the log burners too, the smell of woodsmoke really added to the authenticity of the place. Well equipped kitchen with everything we needed, the carrot cake was to die for thank you, with a lovely big table with loads of space for us all (7 adults) to sit round. Plenty of books, DVDs, games if you need them,satellite television in both kitchen and lounge. We had a baby and a dog with us, both were catered for very well with a travel cot supplied (on request) for baby and doggy bits and bobs for the dog. Also had a secure garden for the dog. We also used the games room which was great, hadn't played ping pong or bar football for years. The only down side was the access, very narrow country lanes. That aside, we all throughly enjoyed our stay at Fletchers Combe Farmhouse. Wonderful location, once you have found it! Really hidden away, a gem. Very well thought out as to what families may need inc good quality bats, balls, games room etc. Incredible amount of bird life. Beauty all around. A Jane Austen type home. (mind your head on the low doorways) You can do walks from the house and there is plenty to do in Devon anyway. Idyllic is the word! Our friends were delighted with the location and style of accommodation. As a party of i6 we were especially pleased with the two areas where we could eat together. The rooms were individually very comfortable and we found everything we needed. Could not ask for better from such a place, and our friends really enjoyed the ambiance and surrounding countryside. We also were very grateful to the housekeeper who could not have been more helpful. Wow, what a amazing stay, can not fault the place, the location and such lovely friendly people. The house was so nice and clean inside and outside with the garden and picturesque views. Both Di and Simon are lovely people who are so helpful, I just can not big up this place enough. I would highly recommend this to anyone if you want a brilliant time away with lots of local attractions so near aswell. 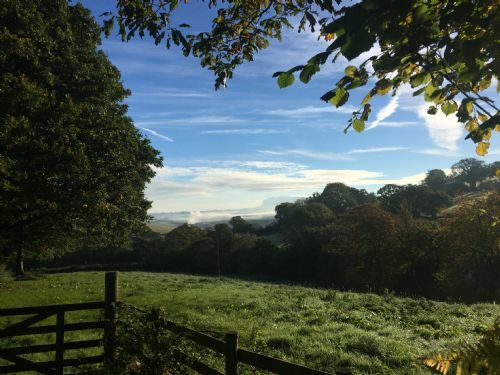 This amazing farmhouse was set in beautiful surroundings with excellent facilities, the perfect family holiday and the dog-friendly approach was very welcome, with goodies supplied for both the 2-legged and 4-legged inhabitants. Our stay was a rare opportunity to get all the family together and it could not have been a more stunning venue, inside and out, from the roaring fire to the roll-top bath, the sumptuous beds, the big kitchen table, the wonderful garden teeming with wildlife and the myriad of beautiful walks without having to go near your car... what's not to like? The manager, the lovely Di, was so accommodating and welcoming to us and our dogs and it immediately felt like home... albeit it far nicer! Spent the weekend in the luxurious barn - superb accommodation set in beautiful country side. Everything you want and need is there really is home from home comforts. Only problem we had is our 16 year old daughter wanted to stay and live there!! The Farmhouse at Fletcher's Combe was lovely and homely, very cosy and welcoming and winter is a great time to stay to utilise the two log burners and the aga. The location was good for exploring Devon, Totnes not far at all by car and the surrounding countryside was beautiful and great for walks with the dogs. It could be a bit tricky to find - We managed OK with our sat nav and the directions provided on the website however the Tesco delivery man got hopelessly lost and was 2 hours late, even the local Indian restaurant which is recommended in the guest book to deliver there had to call us for directions when he got near. The mobile reception is very poor as well and there is no landline in the house which doesn't help. The games room was better than expected and the beds comfortable. Di was really helpful in providing information prior to our stay she is really friendly and gets back to you super quickly. Another plus is how accommodating she is about dogs staying, even providing a nice welcome pack for them too! We also had a really lovely Christmas surprise of sweets, biscuits and pannatone waiting for us humans on arrival - Thanks Di! The only negative comments surround the kitchen equipment - A lot of appliances weren't in the best of condition and could do with replacing. It was also a bit disappointing to find that many of the utensils, pots, pans and crockery needed a really good scrub before they could be used. Apart from that we had a lovely stay and made the most of the facilities and cosy comfortable environment! Hello Miranda. Thank you so much for submitting a review. I'm glad you enjoyed your stay (and the Christmas treats!) and thanks for the lovely comments on the house. I'm really sorry you experienced problems with some of the small appliances and had some issues with cleanliness of utensils. I will ensure that everything is thoroughly checked and replacements made as necessary. We are actually closed for the first two weeks of February for a new Howdens Kitchen to be fitted and I was planning on replacing a lot of kitchen equipment then. I do hope you'll return to see the transformation! We are aware that the kitchen in the Farmhouse has not been up to scratch so I have made it a priority for the coming season. Many thanks again for coming to Fletchers. Kindest regards, Di. This was the second time we had spent Christmas at fletcher's Combe and it was really beautiful. Di was extremely helpful and the house was wonderful, we had a lovely time. I don't think I can sum up our experience of Fletchers Combe any better by explaining that this was our third (and hopefully not last, by far) visit! We have previously stayed as a large group at Fletchers Combe Barn, which has made for some very enjoyable and very memorable family holidays. This time, being only a group of four (plus two four-legged friends), we opted to stay at the Farmhouse, and we were not disappointed at all. Offering a different, but still fantastic, experience, we would definitely return to either choice of accommodation again. From piling in visiting family members and holding BBQs for 20 people (and never tripping over each other at any point) in the Barn, to a cosy night in with the woodburner in the Farmhouse, our stays have been nothing but perfect on every occasion. Always very clean and welcoming on our arrival, with all the necessities to hand, Di does a brilliant job preparing for your stay and is always at-hand (but at an unobtrusive distance) if you need anything. With welcome packs full of information on local activities and amenities, acres of land at your fingertips, and even a selection of local takeaway menus, you're ready for your holiday from day 1, whether you opt to stay in and relax, or make the most of the nearby areas. The family dogs also give the place their furry thumbs up - with fenced-in gardens, plenty of walking routes, and even the doggy essentials on hand (crates, bowls, even poo bags just in case! ), it's the perfect dog-friendly holiday. A 25 minute drive to dog-friendly beaches, several dog-friendly pubs nearby, and if you do decide to have a bit of 'me' time, there are nearby kennels or pet-sitters to give you the chance to explore the venues that don't allow those of the canine type. 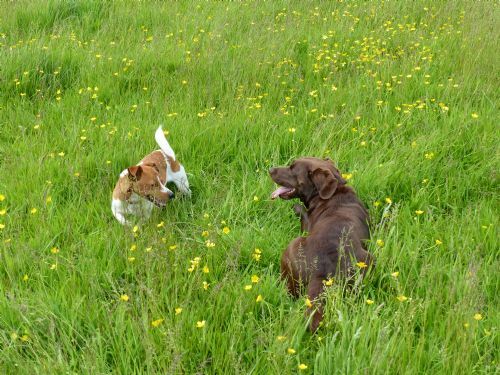 I wouldn't hesitate to recommend Fletchers Combe for all manners of holidays, whether it's small groups, large parties, with or without dogs. And we certainly hope to be back again soon! Di was very helpful, came to see us when we first arrived, explained everything and answered any questions. Was about every day and would help if needed. The cottage is nearer a 10 minute drive from the main road as the roads are very narrow, and keep your fingers crossed nothing coming the other way. But a beautiful location, very quiet and very relaxing. The duck pond outside the back door was always teeming with wildlife, from moorhens to dragon flies, and a constant source of pleasure to Milly our labradoodle. The farmhouse was both well maintained, clean and spacious. Wifi was a bit hit and miss, but generally was fine, and for a telephone signal I had to walk to the top of the garden, but we were on holiday and making phone calls was not a priority. Good games room with table tennis, skittles and table football. Totnes a nice town with a wide range of different shops and plenty of local pubs serving good food. Second time we come here from France, really an amazing place ! Very calm and quiet, the best sleeping nights ever ! Lovely settings and furniture, fully equipped inside and outside, everything is made to make you feel comfortable and "at home". Stunning views around. We also enjoyed the games room ! Great location for exploring the surrounding area and enjoying peace and quiet. Close to the coast and beaches, lots of things to do and visit around... And many thanks to Di for her warm welcome !